Never has a more truer quote been uttered. Breakfast food is my jam. I LIVE for breakfast. I start planning for it the night before and get so excited to eat it I can hardly sleep. I find it hard to pick a favourite when it comes to breakfast food, BUT these crispy breakfast potatoes are definitely up there. We were at a small town diner in Texas when I was first introduced to the humble breakfast potato. Up until then, I thought potato only had a place at breakfast in the form of a hash brown. But boy was I wrong. 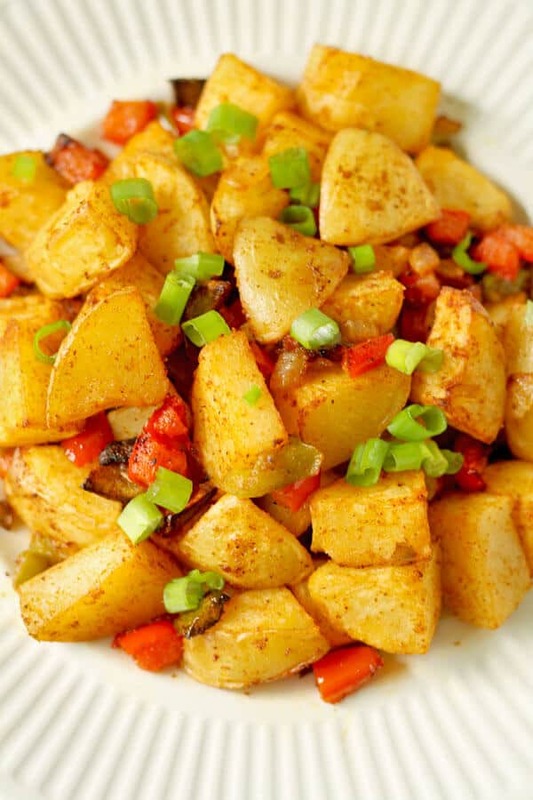 There’s so much to love about breakfast potatoes! 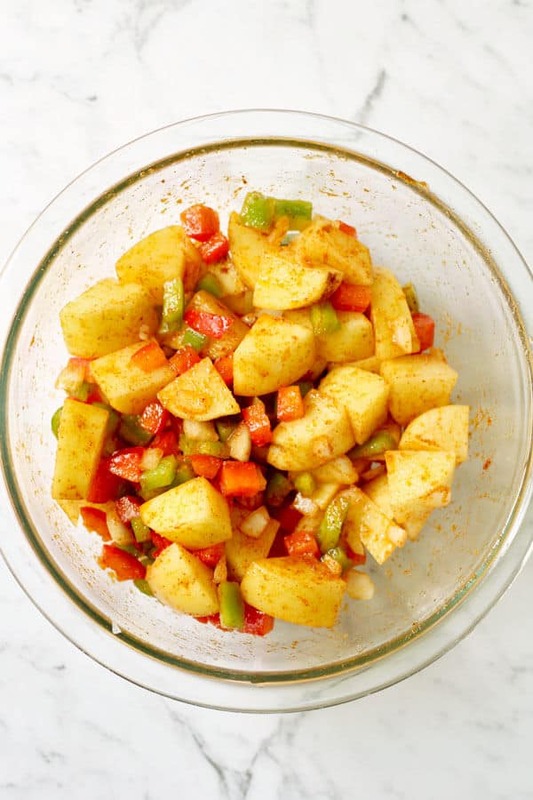 They’re crispy, spicy and help you pack in a few more veggies in your day. They’re also Whole30 Compliant, Paleo, Vegan and Gluten Free. And the very best part – they are super easy to make at home! 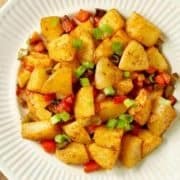 To make these Crispy Breakfast Potatoes you’ll need..
Olive Oil – OR you can use coconut oil, grapeseed oil or another good roasting oil if you’d prefer. 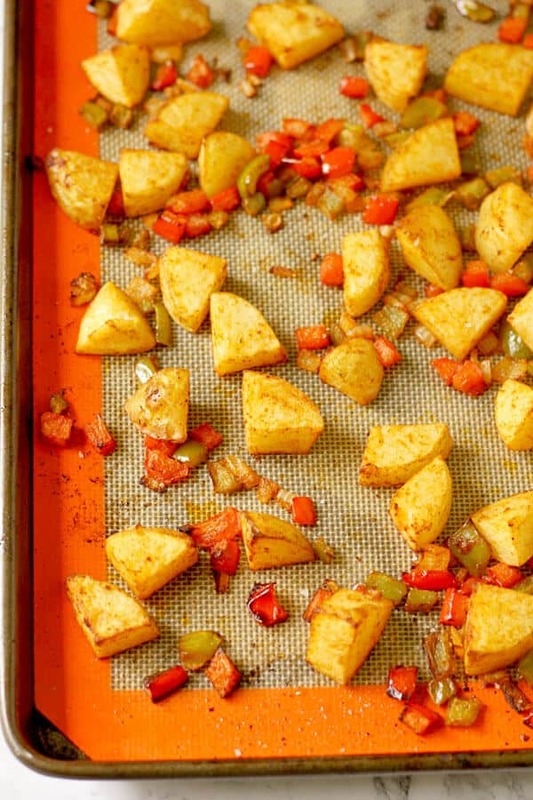 Tip: Select a good roasting potato for this recipe. 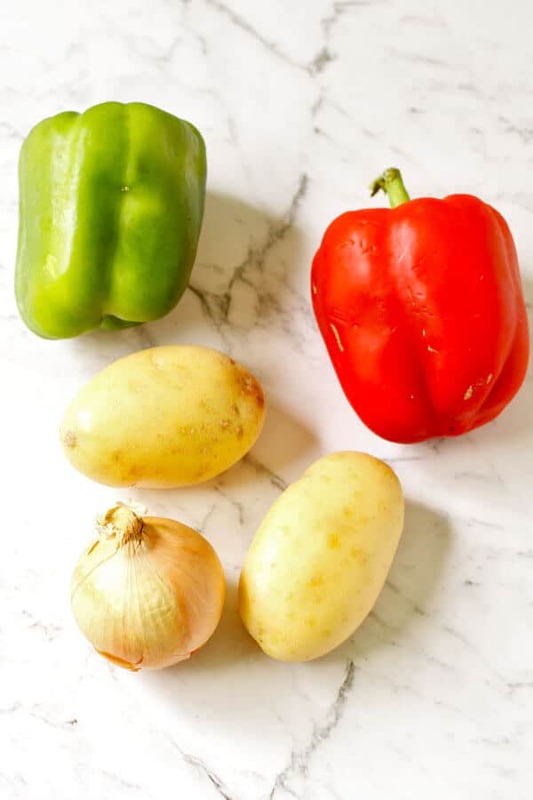 If in doubt, try to find one of these types of potatoes in your local supermarket or fruit store – Yukon Gold, Russet, Golden Delight, Sebago or Creme Royale. Mix all the ingredients (except salt) in a large bowl. Spread the ingredients out onto a baking tray lined with baking paper and arrange in a single layer. Cook for 20 minutes, stirring halfway through. Turn the oven up to 220C / 420F. Give the potatoes another quick stir, then place back in the oven for 10 minutes, or until golden brown and crispy. Tip: Don’t skip step 4. Turning up the heat for the last 10 or so minutes helps the potatoes to crisp up on the outside. The contrast of the crispy exterior with the soft, fluffy interior is what makes this dish so great. If you’ve tried these Crispy Breakfast Potatoes I’d love to hear how you enjoyed them! Pop a comment and a star rating below! You can also FOLLOW ME on FACEBOOK, INSTAGRAM and PINTEREST to keep up to date with more delicious recipes. 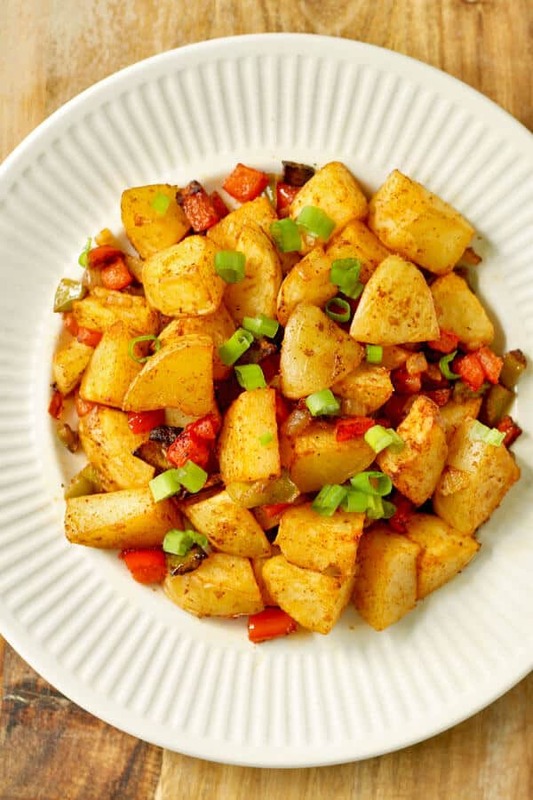 Crispy Breakfast Potatoes are the side your breakfast needs ASAP! Crunchy, spicy and full of flavour, they are sure to put a delicious spin on whatever you're serving up in the morning! PICK YOUR POTATO - Any good roasting potato will do here so feel free to use your favourites. If in doubt, look for yukon gold, sebago, russet, golden delight or creme royale in your local supermarket. OIL - Feel free to use coconut, grapeseed or another good roasting oil if you'd prefer. UPDATES - First Published February 26, 2018. Last Updated January 7, 2019. No changes to the recipe, just updated with more tips and tricks for getting perfectly crispy breakfast potatoes every time. NUTRITION - Nutrition information is a rough estimate for one serve.. I love to make my potatoes in the oven with the meat together, so that potatoes have the flavor of the meat, it is really delicious. That’s how I like to make my roast potatoes too. But for breakfast I’m usually not making up a roast meat haha! Hehe Cassie of course. I eat oats in the morning, they are my perfect nutrient meal but I will try these potatoes for a late breakfast. Like what am seeing so far would like c to try these recipes . Please show more. Thanks Carol 🙂 Let me know how you go if you try any! New recipes are up every Monday.